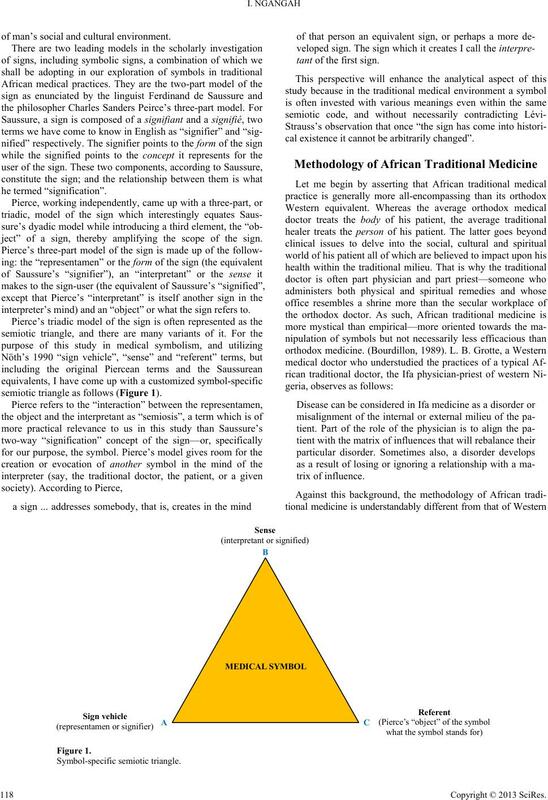 nomenological implication of African medical symbols. symbolic import within the context of a given cognitive system. in the cultures of the people of Africa” (Isiguzo, 2010). cerns of semiotics (Chandler, 2012). specifically with a special group of signs called symbols. N. K.
ous or conventional meaning (Dukor, 2006). to that object (Peirce, 1931). of man’s social and cultural environment. ject” of a sign, thereby amplifying the scope of the sign. interpreter’s mind) and an “object” or what the sign refers to. semiotic triangle as follows (Figure 1). tant of the first sign. cal existence it cannot be arbitrarily changed”. description of the methodology employed by his Ifa counterpart. integral part of the methodology used by traditional healers. 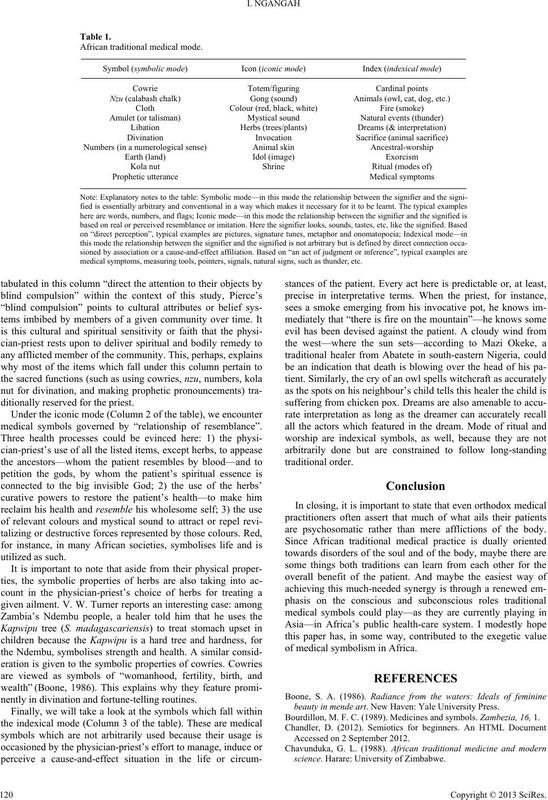 methodology of traditional medicine is similar across Africa. among the Bon community of India. in this third section of the study. causes of the patient’s ma lady. other medical symbols employed by the physician-priest. of understanding what is signified by that term. medical symbols I have identified in the course of this enquiry. have explained how one mode differs from another. like orthodox medicine, at the expense of the spirit and the soul. medical symptoms, measuring tools, pointers, signals, natural signs, such as thunder, etc. ditionally reserved for the priest. medical symbols governed by “relationship of resemblance”. nently in divination and fortune-telling routines. are psychosomatic rather than mere afflictions of the body. 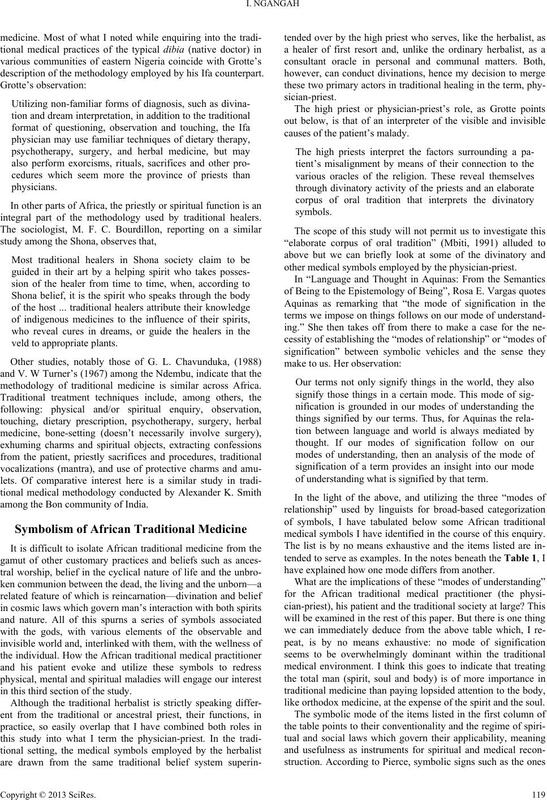 of medical symbolism in Africa. beauty in mende art. New Haven: Yale University Press. 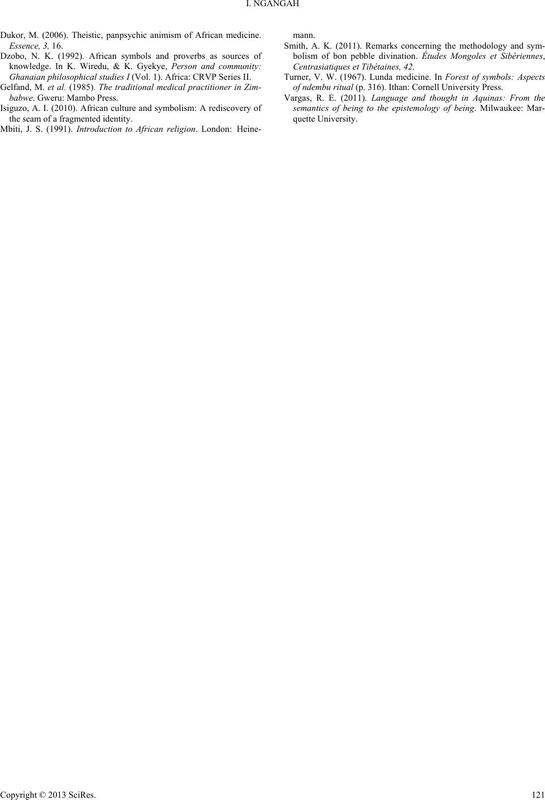 Accessed on 2 September 2012.
science. Harare: University of Zimbabwe. Dukor, M. (2006). 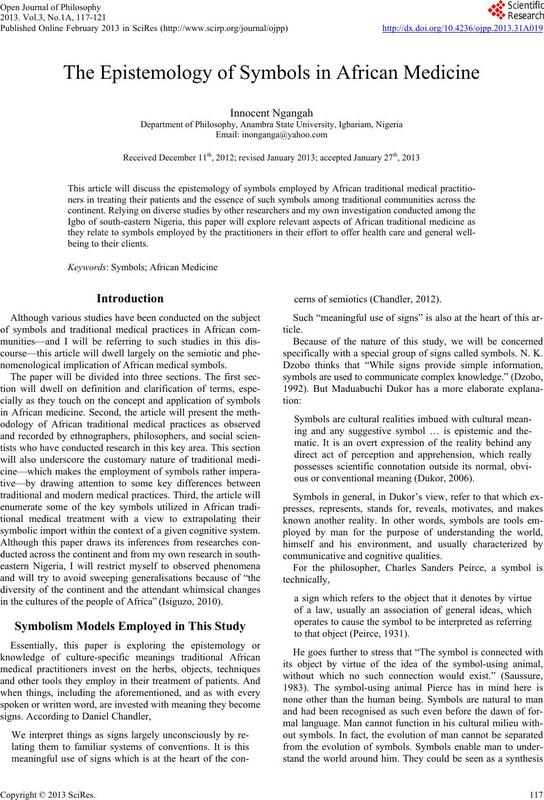 Theistic, panpsychic animism of African medicine. Ghanaian philosophical studies I (Vol. 1). Africa: CRVP Series II. the seam of a fragmented identity. of ndembu ritual (p. 316). Ithan: Cornell University Press.